Maybe it's because Aria is due right before Christmas but the other day I found myself on Pinterest pinning ALL THE CHRISTMAS THINGS. My brain knows that as soon we start decorating, we are in the home-stretch! We are planning on putting up decorations earlier than usual just because once Aria's here I will have zero motivation to do anything but snuggle all my babies. I have this vision of sitting on the couch, nursing Aria, Peter and James are watching a Christmas movie with Andrew, and the only lights on are those of the tree. Seriously how amazing does that sound? Then when she's done nursing, Andrew will bring me a glass of wine.... Can't. Wait. However, I personally think that anything Christmassy should not happen before Thanksgiving. So to satisfy my need to nest/craft, I decided to do some decorating for November. I didn't feel like going out and collecting supplies for a project so I just looked around the house at the things I already had. I finally decided to use an empty frame that we've had since our wedding. We used empty frames (that we found at Goodwill!) at our reception for guests to take pictures with. I've pretty much repurposed all of them except this one. So it was finally time to put this one to good use. For this project I used scrapbook paper (by Maggie Holmes), scrapbook tape, hemp string (current favorite craft item), an empty frame, fall foliage (optional), tiny clothes pins, and a hot glue gun. 1) I cut squares at roughly 2x2 from my scrapbook paper. I tried to use more muted patterns with grays and browns. Nothing too bright. 3) I then cut smaller squares to go in the middle of the larger ones. 4) Then my sweet husband (who has much better handwriting than me) wrote out a letter on each tiny card so that they read "Thankful Heart". 5) After that I used scrapbook paper to attach the letter to the the bigger squares. 6) On to the frame! Giving myself the option to use this frame for something else at some point, I simply taped two rows of hemp to the back. 7) Then using my tiny clothes pins I clipped each square to the string. 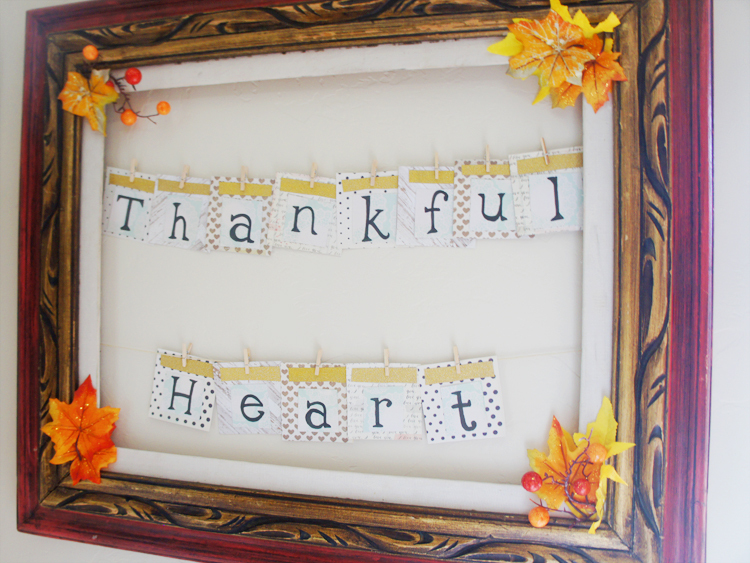 8) Finally, I added a little fall foliage to each corner of the frame with a glue gun. This is totally optional depending on what kind of frame you use. The only reason we keep our kitchen table set at 8 is because my crafting usually explodes and has babies, leaving us very little eating room. Oops. I'll probably have to come up with a few more decorating ideas just to keep my nesting in check but we'll see. If you decide to give this DIY a try, post your finished piece to Instagram and tag me so I can see!